It’s the weekend and you know what that means? Time for a pamper session! And in this horrible, cold, winter weather there’s nothing more satisfying than a nice, steamy, fragrant bath. Aaaaah. I don’t know about you, but I find a bath is ten times more fun and satisfying when you’ve got a bath bomb involved! It’s that feeling you get when you crumble it in, and watch it fizzzzzz around and turn the water into different colours. Like a firework in the water, except much more relaxing and soothing and with no children running around you with sparklers. And for me, there’s only one place to get a bath bomb (or nine, in this case) and that’s LUSH! Y’know, that shop which you can smell before you even see it? That shop with the assortment of multi-coloured cheese-wheels of soap? 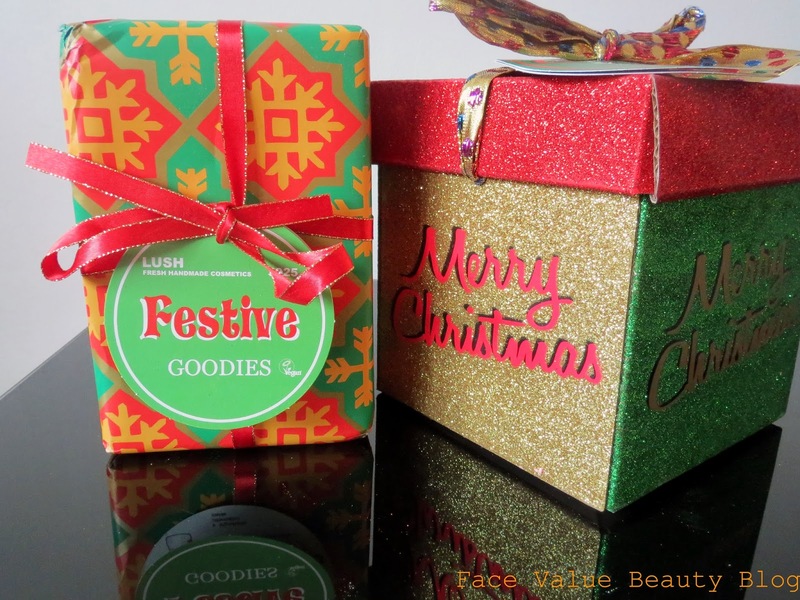 You may have seen my post about the Lush Christmas Range and now, with those bath bombs in my happy hands, let’s take a closer look! Aren’t they adorable??! A great array of shapes, sizes, scents and shimmers. Which one do you like the best? First of all – the traditional bomb shapes with a Christmas touch. 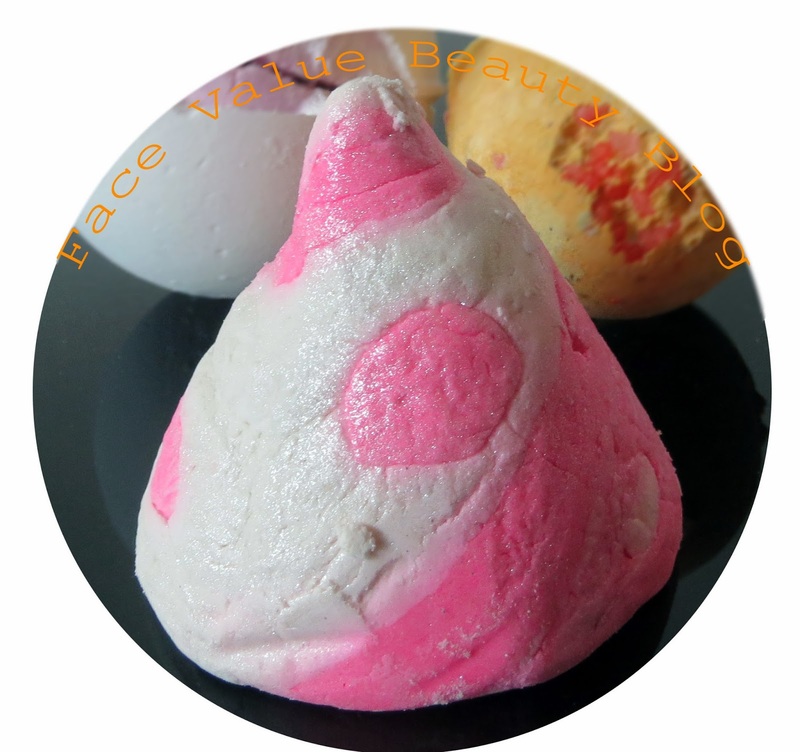 On the left is So White – a bergamot infused ball of snow with a gorgeous rose pink centre which turns the bath pink! It looks like I’ve conveniently broken through to show you the secret inner pink layer but… i actually dropped the bath bomb. Its smaller neighbour on the right is Cinders – with orange, cinnamon and crackling candy!! For reals, it pops in the bath! Very Christmassy this one – reminds me of mulled cider, mmm. Next on the list is this Candy Mountain Bubble Bar. 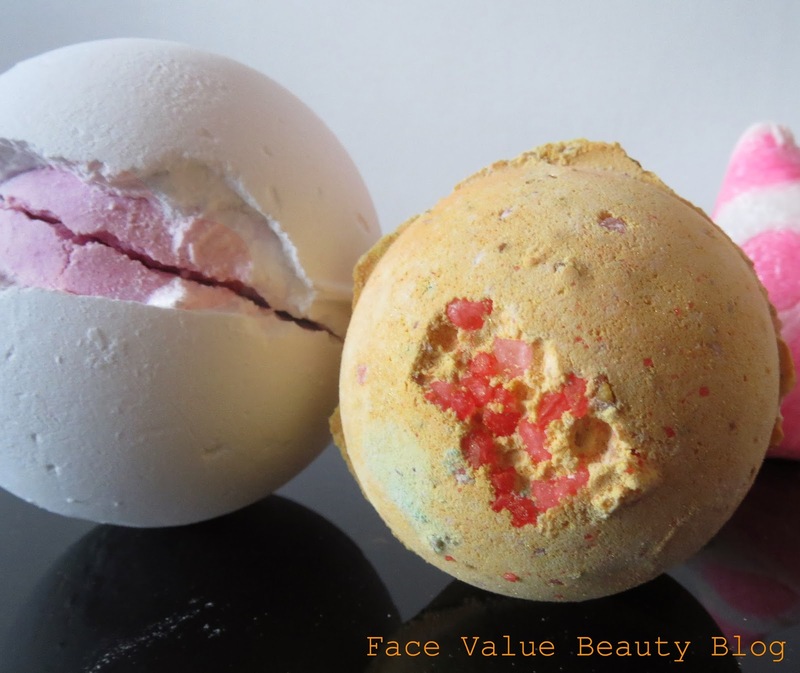 Very Vanilla-ry and very pink, it makes shiz loads of bubbles and turns the bath pink too! It also leaves a subtle shimmer on your skin, ideal for those who have a bath in their getting-ready routine! 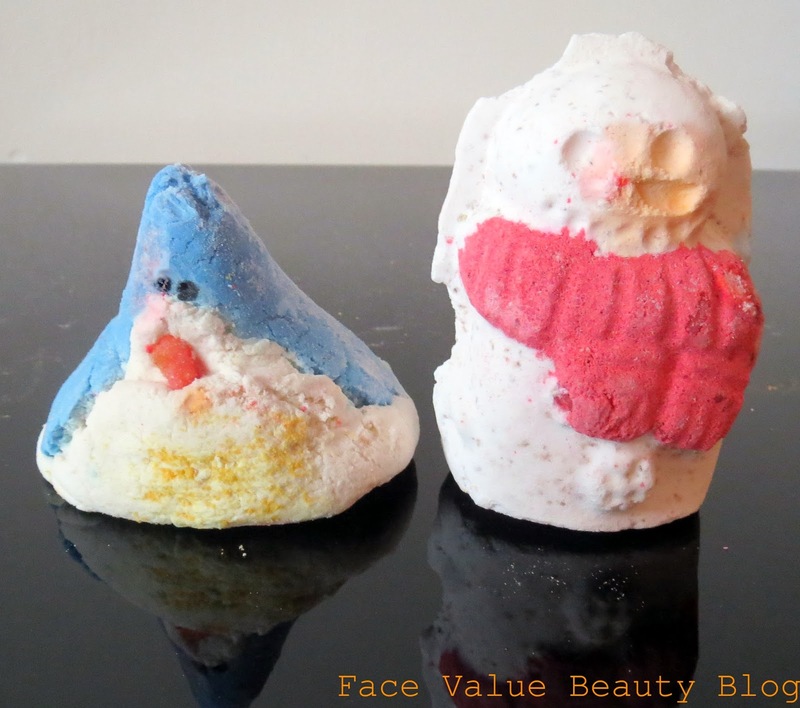 These two bath bombs are two of my Xmas favourites! The Christmas Penguin and The Snowman! Mr Snowman (minus his nose, ooops) is vanilla and cocoa butter and you can really feel it’s moisturizing power when you’re in the bath! The Christmas Penguin bubble bar is another foam-maker and is a perfect choice for those who prefer fruity, sharp scents over vanilla as it smells of lemon and citrus! The fantastic four. 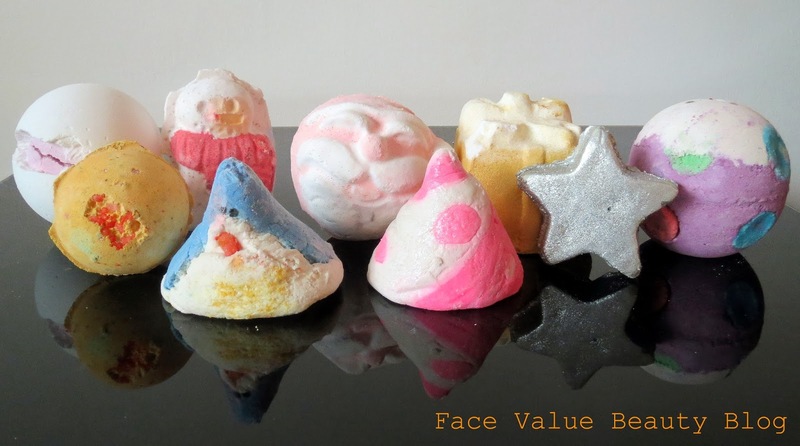 Meet Father Christmas, Golden Wonder, Star Light Star Bright and the Luxury Lush Pud…..
Father Christmas is a mandarin dream and turns your bath both pink and green! This year’s Father Christmas doesn’t have the red glitter in it that it had last year though, I quite enjoyed that glitter but my towels are grateful at least. Golden Wonder is a shimmery turquoise bath which smells of orange and cognac – very Christmassy scents again. I’ve not had this one in the bath yet but apparently it’s really moisturisng too. 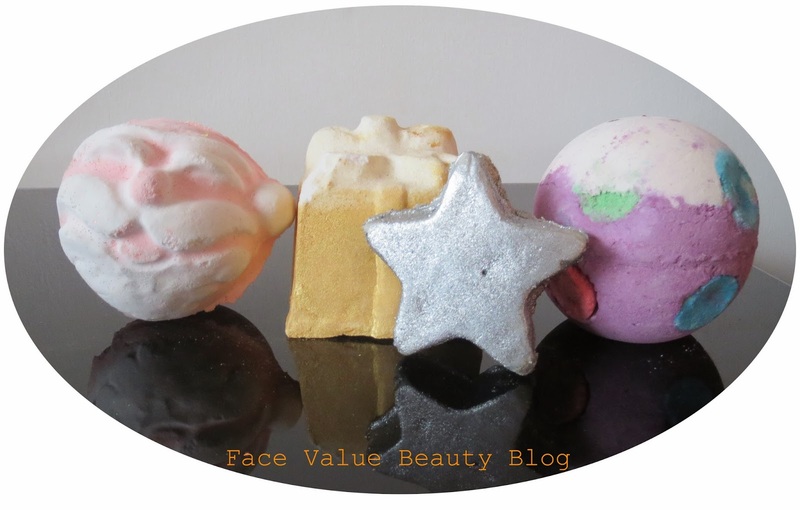 Next up – my favourite scented bath bomb – Star Light Star Bright. With ginger and lime, this is a refreshing, invigorating turquoise bath which I love. It also has shea butter in it which moisturises as you soak and oh – the silver shimmer looks awesome on your skin too! And finally – the Lush Luxury Pud. A christmas pud like no other. Quite ironic because I did talk about (slash rant) how much I hated Xmas puddings in my previous Lush Christmas post. The Luxury pud is a Lavender lovely and the multi coloured bits turn your bath different colours! Just be careful not to knock them out while you’re storing the bath bomb, they have a tendency to fall out and leave you wondering why your bath bomb has craters in it.. Which of these wonders is your favourite? I guess it depends on what scents you like – are you a vanilla and cocoa kinda girl or do you a fruity or floral fan? ** Thank you to Lush for providing me with these gift sets! The Library Of Fragrance: Every scent you ever wanted! Xmas Is Coming… Dowal Walker Winter Wonders revealed! I love lush bath bombs, I'm going to have to go shopping now after looking at these. I loooove Luxury Lush Pud!